Autodesk Inventor is a favorite tool of engineering professionals. To fabricate your Inventor designs on the Bantam Tools Desktop PCB Milling Machine, a few steps are required. Because Inventor is only a design application, an additional CAM (computer-aided manufacturing) application or plugin is required to generate toolpaths and G-code that the milling machine can follow to mill the design. For more information on the overall CAD and CAM process, see our CAD and CAM Guide. Option 1: Model your part in Inventor, generate toolpaths and G-code from within Inventor using an integrated CAM plugin such as Inventor HSM, and then load the G-code file into the Bantam Tools Desktop Milling Machine Software. 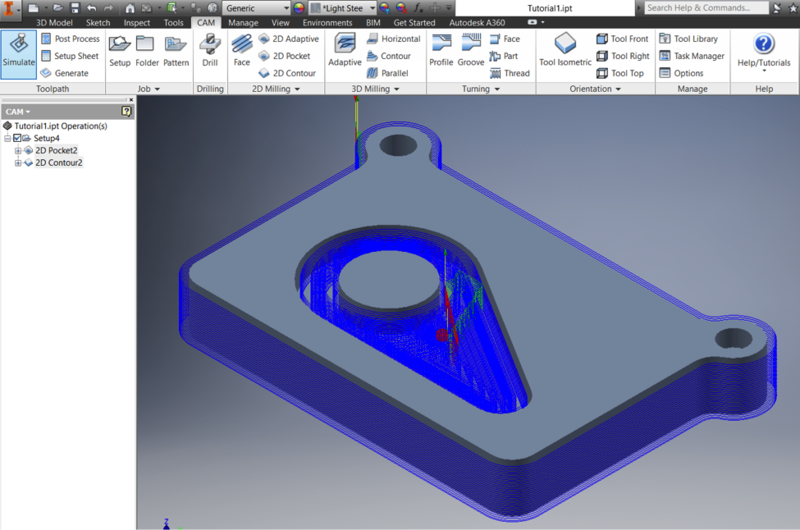 Option 2: Model your part in Inventor, export it as a STEP file, generate toolpaths and G-code from that file in a separate CAM application such as Fusion 360, and then load the G-code file into the Bantam Tools Desktop Milling Machine Software. Option 1 (using an integrated CAM plugin) is easier, more convenient, and provides a higher-end feature set. It allows you to skip the added steps of exporting a STEP file and loading it into a separate CAM program. The only trade-off is that it’s usually more expensive. However, if you expect to be iterating rapidly and milling a lot of prototypes of your parts, the extra speed and convenience may be worth it. 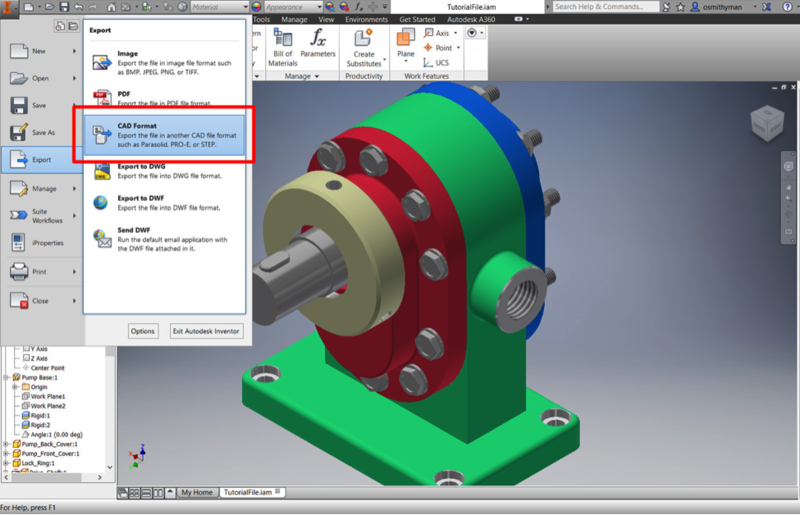 This guide shows the process of generating G-code from Inventor using the Inventor HSM integrated plugin. If you choose to go with Option 2 and use a separate CAM application, this guide also demonstrates the process of exporting a STEP file from Inventor, which you can then import into a CAM application such as Fusion 360. From there, you can generate a G-code file that can be imported into the software and milled on the milling machine. 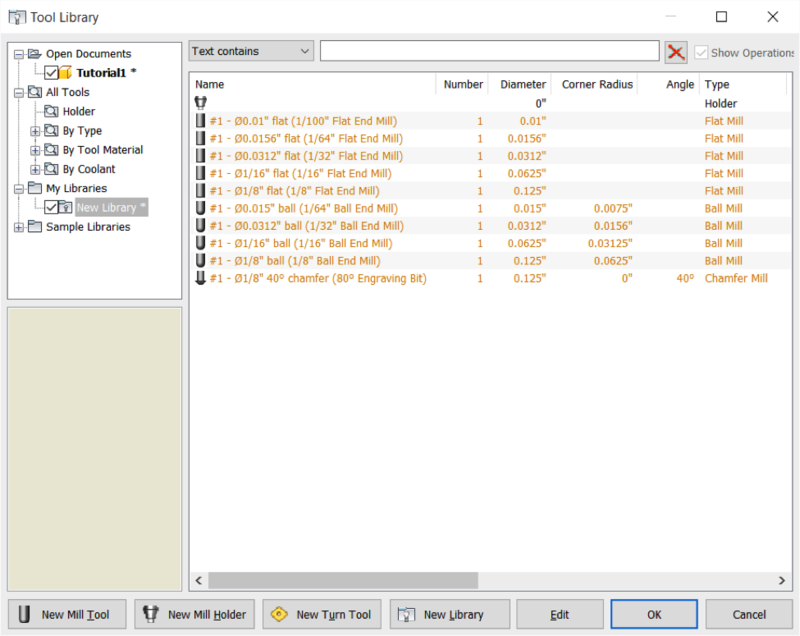 This section shows how to use an integrated CAM plugin to generate a G-code file that can be imported into the software to mill your part. 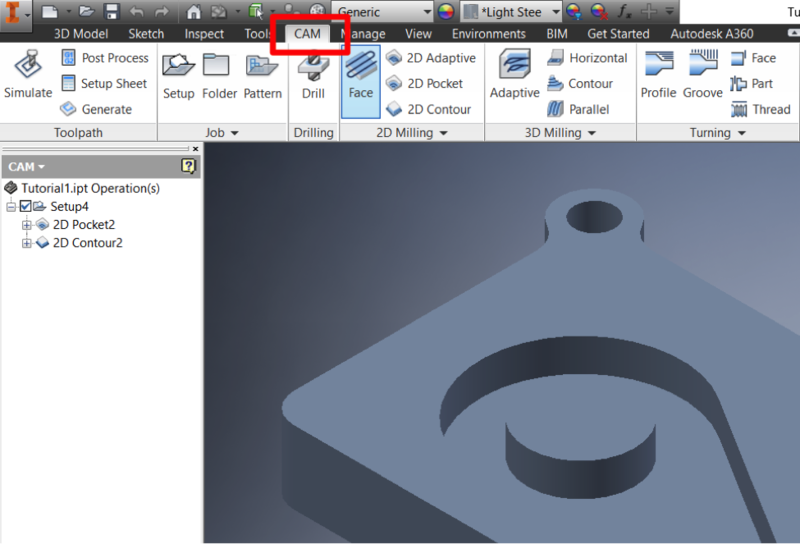 Autodesk products have excellent integration with the milling machine, so this guide specifically shows how to use Inventor HSM with the milling machine. Step 1: Switch to the CAM tab. 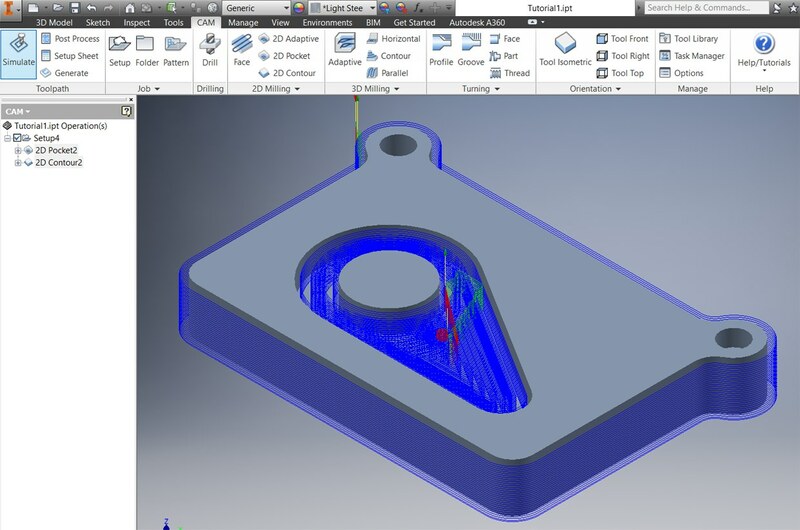 Once you’re done modeling your part in Inventor, switch to the CAM tab. The CAM tab contains all the available milling strategies that you can use to mill your part. The CAM tab selected in Inventor. Step 2: Install the Othermill tool library. Start by downloading and unzipping the Othermill tool library. 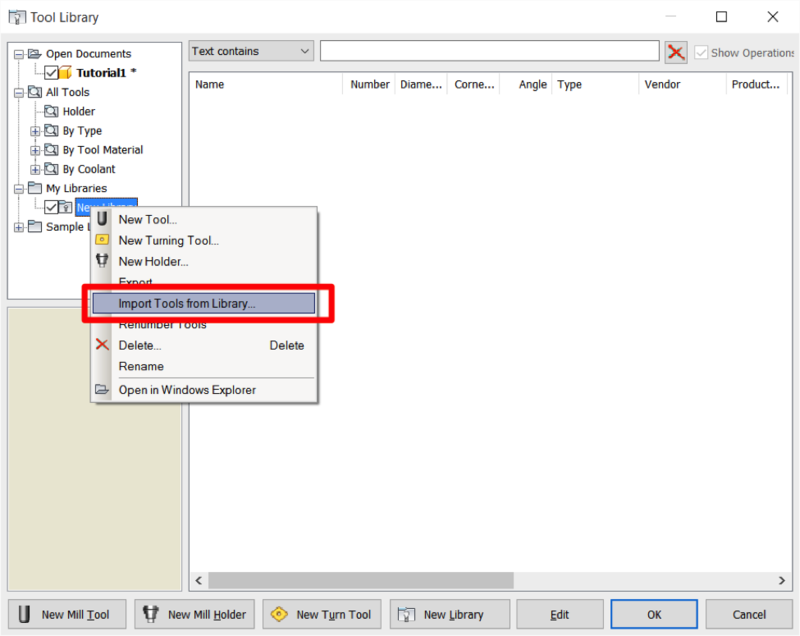 In Inventor HSM, click the Tool Library button to open the Tool Library window. The Tool Library window with New Library selected. “Import Tools from Library” selected. 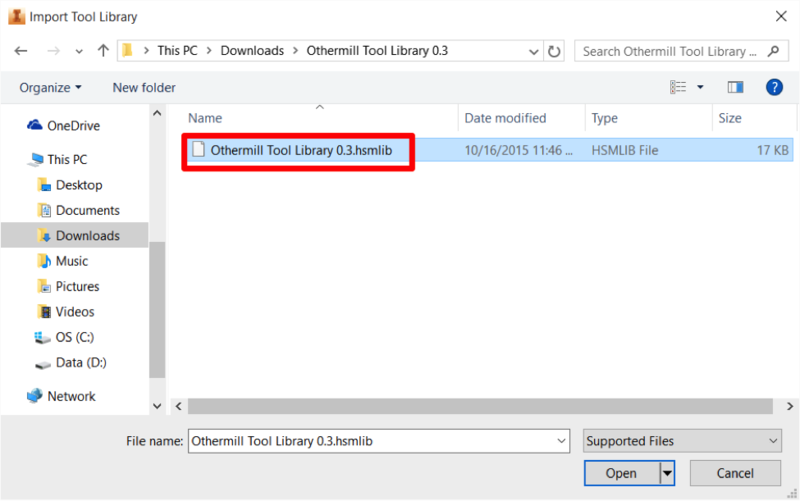 Othermill tool library successfully imported into Inventor HSM. Step 3: Choose your machining strategies. Here's where you decide how you’re going to machine each feature of your part. If you’re new to CAM, there’s a bit of a learning curve. CAM is a pretty deep subject, but each CAM application has tutorials to help you learn how to use it. Here are Autodesk’s Inventor HSM tutorials. Pocket and Contour toolpaths (blue) generated for a part in Inventor HSM. Step 4: Post-process your toolpaths. 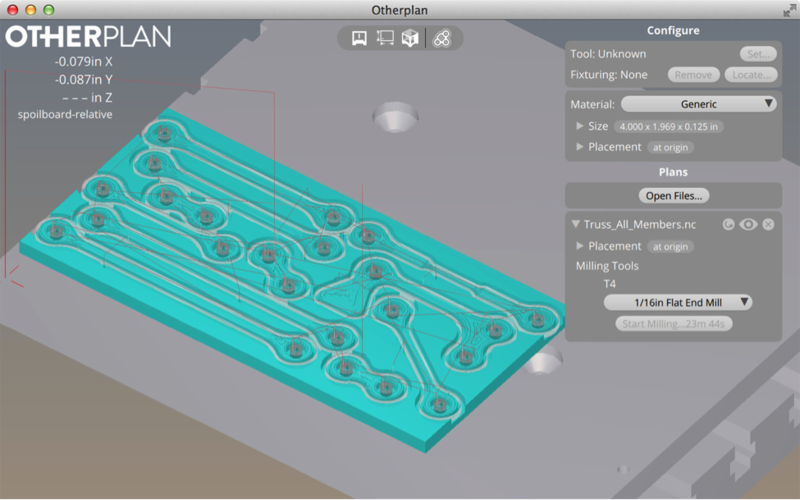 Select the Othermill post-processor from the dropdown list. Congrats! You’ve successfully generated a G-code file that can now be imported into the software and milled on the the milling machine. If you’d prefer to use a separate application for CAM, here’s how to export a file that can be imported into that application. Step 1: Save your Inventor part as a STEP file. When you’ve finished modeling your part in Inventor and you’re ready to fabricate it, start by saving it as a STEP file. 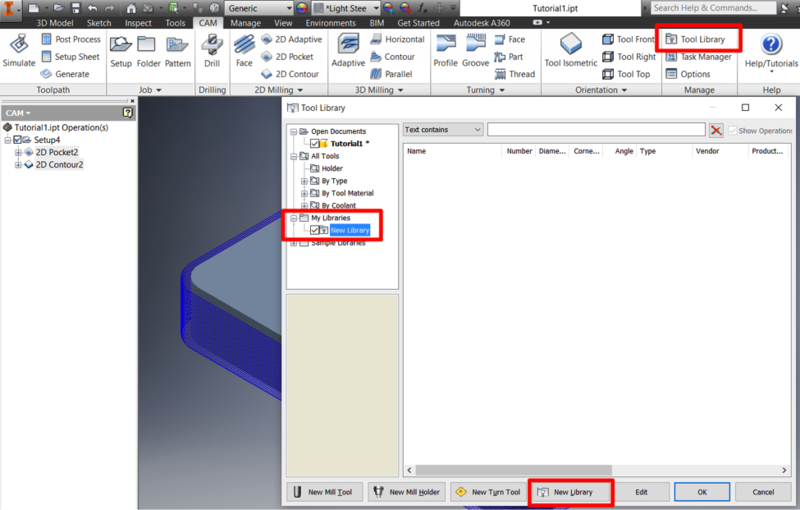 From the File menu, choose Export and select CAD Format. 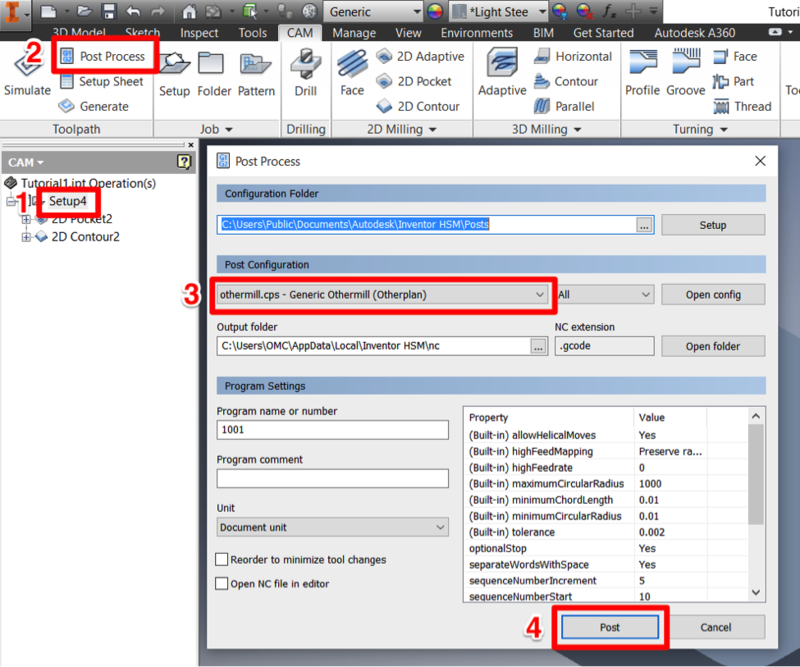 In the Save As window, choose STEP Files (*.stp, *.ste, *.step, *.stpz) from the dropdown menu. Once you save your file, you’re done with Inventor and ready for the next step (pun intended). 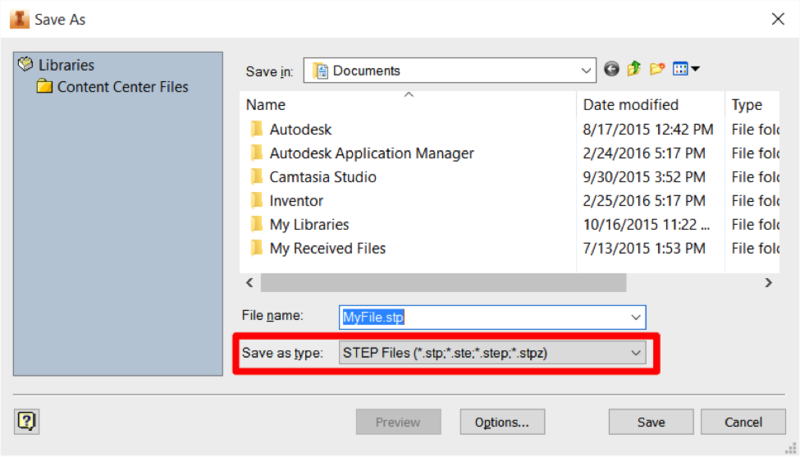 Now that you’ve exported a STEP file from Inventor, you can import your STEP file into the CAM application of your choice. We like Fusion 360’s ease of use, so if you don’t already have a favorite CAM application, check out the our Fusion 360 guide. There are many other CAM applications to choose from, and each one should have tutorials or guides to show you how to generate toolpaths and export G-code files.